“LGBT people always stand together for each other,” survivor Adrian Lopez says. “But now we’re just stuck together, you know?" Photography by Gavin Bond. Photographed at Studio One, Orlando, FLA., on August 31, 2016. Groomer: Jeptha Lee. 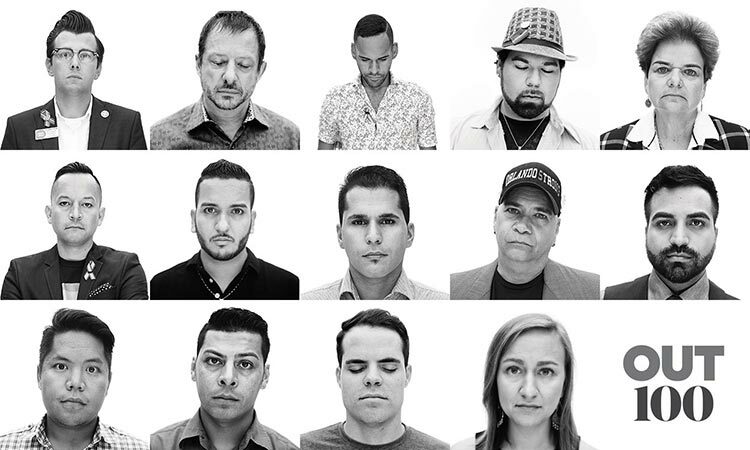 From top left: Michael Farmer, David Baker-Hargrove, Angel Colon, Chris Hansen, Pat Sheehan, Carlos Guillermo Smith, Tony Marerro, Adrian Lopez, Terry DeCarlo, Ricardo Negron, Michael Deeying, Javier Nava, Joe Sanders, Hannah Willard. While waiting to be photographed, the survivors of the Pulse mass shooting in June chat casually, but not about the overcast weather or what they’re binge-watching. They’re talking gunshot wounds — how to change a bandage, what’s the best home remedy to reduce swelling. One survivor, Chris Hansen, leans over to another, Tony Marrero, to share his secret. “Coconut butter,” he says. He swears by it. The grisly conversation would sound surreal in any other group, but the Pulse survivors likely feel more at home with one another than anyone else. The savage massacre at the LGBT nightclub shocked the Orlando community, the nation, and the world. In the United States, joyful Pride marches celebrating a full year of marriage equality turned grim, remembering the hate that had cut so many lives short. While the survivors bear the scars of that night — Pulse’s Latin night — the tragedy they faced has not silenced them. Sitting with the survivors are local and state leaders in the LGBT community. They discuss fundraisers, interviews, calls with politicians — the work they must shepherd to transform the terror of this attack into real change. In the aftermath of the shooting, survivors and leaders alike are grateful for how allies have joined them in calling for an end to violence against LGBTs. For now, this family celebrates the small victories of recovery — a last hospital visit, the end of physical therapy. Survivor Angel Colon enters the studio on a crutch. The group applauds; they hadn’t expected to see him walking. “I was ready to get out of that wheelchair,” he says as he takes halting steps across the room, hugging his fellow survivors as he moves forward.